Sterling rallied today following a surprisingly bullish report on UK inflation. Core consumer prices rose at an annualized rate of 1.2% to the month to July. This was far ahead of the expected rate of 0.8%. Without the effects of food and energy (none core items) the rise stood at just 0.1% on the year. According to the UK Office for National Statistics’ report clothing prices where a main contributor to the unexpectedly high inflation levels. The latest data has pushed UK inflation to a five month high and has increased the odds of the Bank of England raising interest rate earlier than expected. 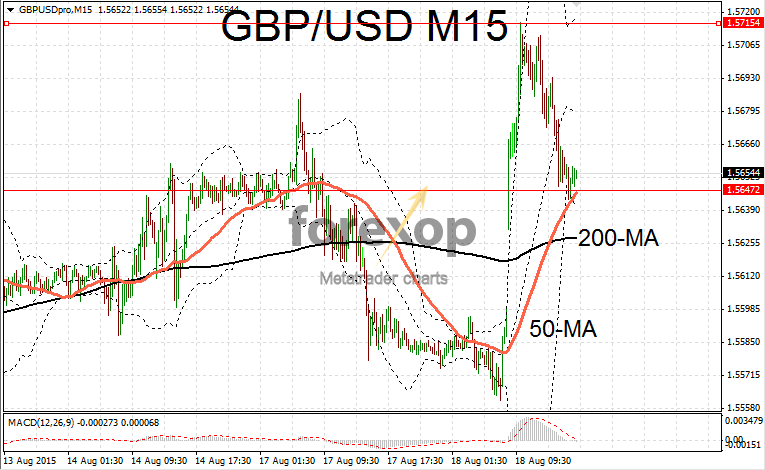 GBP/USD surged one percent on the release with a spike up as high as 1.5715. Cable later eased back as the US dollar was boosted by a positive report from the housing sector. Following the release GBP/USD was trading back down towards the support area at 1.5647 as the dollar regained some of the lost ground. EUR/GBP took the brunt of the rally with a drop of 1.2%. EUR/GBP plummeted to 0.7044 and was trading below its 200-day moving average. The euro has turned bearish on the hourly charts after reaching a significant technical high against the dollar earlier in the month. German government bond yields have fallen back over the same period. The 10Y has dropped another nine basis points over the past week to 0.636. This level is far below the peaks seen in June when yields were breaking over the 1% level. GBP/JPY managed to push higher on the day with a move up to 194.96. The latest rally puts the pair within reach of the high of 195.81 reached in June. This marked a seven year high on GBP/JPY and was followed subsequently by a retracement of 5% (half of the rally). Support is likely around the 193.96 area and resistance at the top end of the 195 range. Negative news affecting sterling came after the latest house price figures were released. Official figures put UK house price growth at 5.7% – missing the forecasted number of 5.9%. The data added to concerns that the property market is cooling – however the detail of the report showed a great deal of regional variations.